Solomon received a Fairfax grant for this land (surveyed in 1750) on 1 Jan 1753 and 9 oct 1756. Early Friends families mentions an Ezekiel Hoge as a probably 1st child of this couple, but there is no mention of this Ezekiel on Lucina Hoge's tree, or the oral history of the children of Solomen Hoge presented in Hoge, Nichols and related families. "Solomon Hoge married out of unity and made an acknowledgement of his error in 1774 and continued to reside in Richland until 1782 when he also too a certificate to Virginia, which included his wife Esther and minor children." This branch of the family is descended from William Hoge, the fifth son of the first William Hoge and Barbara Hume. He moved from Pennsylvania and settled in Loudoun County, Virginia. He married a Quaker and whether or not his descendants have kept to that faith, they are sometimes called the "Quaker Branch" and, always, the "Loudoun County Hoges," although they have become multitudinous and widely scattered. L. Clark Hoge resides at Leesburg, Va., and is the son of James M. Hoge, who died about two year ago, at the age of eighty-six and who appeared in "Who's Who in Virginia," published several years ago. His family traces back to Isaac Hoge (d-977). The grandfather of Clark Hoge was also named Isaac. His wife was Rachel Schofield. Lucius Hoge, Jr., of Clarksburg, W. Va., is a son of Lucius Hoge, Wheeling, W. Va., who is a son of Isaac Hoge, the son of William Hoge, of Loudoun County, Va., who moved to Belmont County, Ohio. In Wheeling also live Ernest K. Hoge, President of the Hoge-Davis Drug Co., W. V. Hoge, Jr., and Arthur K. Hoge, M.D. Gordon Hoge, with Young and Rubicam, Advertising, New York, is the grandson of William M. Hoge, who was well acquainted with Governor Tyler, and presumably was the William Hoge, of New York, referred to by him. See David Hoge (d-957). Gordon Hoge is a nephew of F. Huber Hoge, of Huber Hoge, Inc., New York, and of Mrs. A. J. Hopcraft – who was a Hoge – now of Hollis, Long Island. Mrs. Mable Hoge Gatley, whose husband is the Executive Vice-President of the Lincoln National Bank, Washington, D. C., is a granddaughter of Solomon Gore Hoge and Julia Ann Jauney of Loudoun County. She has a sister in Columbus, Ohio, Mrs. Martin X. Wisda. W. S. Hoge, Jr., lives in Washington, D. C., and his sister, Mrs. Ann Hoge Savage, in Baltimore, Md. Robert F. Hoge, 17 West 71st Street, New York City, is reputed to take considerable interest in the history of the family. There are many Hoges in the west. See foot note on page 74. Many are Loudoun County Hoges. Wendell Phillips Hoge lives at 1650 East Orange Grove Avenue, Pasadena, Cal., and is with the Mount Wilson Observatory of the Carnegie Institute of Washington. The Observatory is on the summit of Mount Wilson, a mile above and eight miles northeast of Pasadena, and is generally regarded as the world's foremost center of astronomical research. Wendell Phillips Hoge is the son of Thomas Rawlings Hoge, who was born in Belmont County, Ohio, in 1817, the son of Abner Hoge. Abner moved from Virginia to Ohio. He was the son of Solomon Hoge, the son of Solomon Hoge (d-974). Wendell Phillips Hoge is first cousin to Mrs. Lucina Hoge Iddings, who made up the tree of the Solomon Hoge branch, and to Annie Hilles, Barnesville, Ohio. He has a son, Edison Rawlings Hoge, and two grandchildren, Kenneth Wendell Hoge and Wilbur Sosey Hoge. His sister, Mrs. Nora Hoge McGraw, lives in Belmont County, Ohio. His sister-in-law, Kate P. Hoge, lives at Wellington, Kansas, and a niece, Mary Black, at Grand Forks, N.D. He has a first cousin, Alvesto Hoge, at Ventura, Cal. Other members of the Loudoun County Hoges in Pasadena, Cal., are: David J. Hoge, 712½ E. Orange Grove Avenue; Smith B. Hoge, 818 N. Marengo Avenue; Jane H. Hoge, 497 Kensington Place; William R. Hogue, 418 N. Chester Avenue; Professor E. Miller, 588 N. Lake Avenue. James Doster Hoge, referred to in the footnote on page 74 is probably of this branch of the family, having been born in Zanesville, Ohio, on September 21st, 1871. He was manager and owner of the Seattle Post-Intelligenzer 1894-1897; he was president of the First National Bank, of Seattle, from 1898-1903; he organized and is president of the Union Savings and Trust Co., of Seattle; he is a director of the Pacific-Alaska Steamship Company and the Pacific Steamship Company. He has other large interests and appears in "Who's Who in America." His address is 1510 Hoge Building, Seattle Washington. 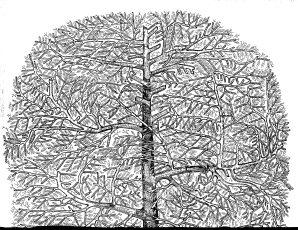 The family tree made by Miss Lucina Hoge (now Mrs. Iddings) will serve as the record of the Loudoun County Hoges. 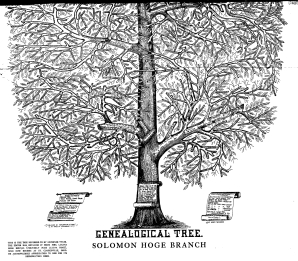 One of the most beautiful family trees I have ever seen, made by Miss Lucina Hoge, Lloydsville, Belmont County, Ohio, and published by McBair and Sons, 141 Race Street, Cincinnati, Ohio, gives the names of over three thousand of the descendants of Solomon Hoge, c-970. The names of the children and a few of the grandchildren and great-grandchildren are given in this record. I have made effort to get the names of others who belong to this family, but have only had responses from William Hoge, of New York, and James B. Hoge, of Cleveland, Ohio, and I have run their families out to show ther connection with the old family. James B. Hoge gave me the names of William Hoge, of Washington, John Hoge, of Zanesville, Ohio, James M. Henderson, ex-Congressman from Cleveland, A.E. Hoge, of Coshocton, Ohio, Thomas Hoge, of Scio, Ohio, and several others, and he sent me a copy of a letter written to each, urging them to send data, in regard to their families. I could not, of course, connect them with the family tree without knowing names in connective order. It seems to me every member of the Hoge family, whether of the Solomon Hoge branch or not, should have a copy of this family tree. It is a monument of beauty and patient work. Some of the children of Solomon Hoge, c-970, moved to Belmont, Ohio, and several of the representatives of this family have gained much distinction. Mrs. A. Hoge, with Mrs. Livermore, published a book, "The Boys in Blue," which is said to be well worth reading. Dr. Robert Underwood Johnson, son of Dr. Nathan Johnson, and Sarah Hoge, daughter of David Hoge, d-975, is principal editor of the Century Magazine. Edwin M. Stanton, it is claimed, was a descendant of this family. A writer says: "In Belmont, Ohio, no matter which way you look, you will see a Hoge or a descendant." Fauquier Co., VA, five miles from Middleburg, Loudon Co., VA, at Uncle Joshua Hoge's. My Grandfather's name was Solomon Hoge, son of William Hoge, the first Quaker among the Hoges. Said William was a son of William Hoge who came from Scotland to America, and was the first progenitor from whom all my relatives by the name of Hoge have descended. Rebecca, b. 12/11/1770. m. William Kenworthy. d. 7/28/1837. Jesse, b. 4/2/1785. m. elizabeth Gregg. d. 9/20/1828. Amy, b. 3/25/1788. d. 7/10/1794. The Rev. Moses Hoge, D.D., was a first cousin to my Grandfather. After he had finished his education he lived some time with my Grandfather, Solomon Hoge, in Loudon Co., VA.
James, William, Joseph, George, Zebulon. Nancy Hays, wife of William Hays, an Irishman, moved to Weston, VA., and had many children. She was a sister of my Grandfather, Solomon Hoge. [S71] Hoge, Family of, James Hoge Tyler (compiler), (Greensboro, North Carolina: James Fulton Hoge, editor & publisher, 1927), page 120 (Reliability: 4). [S67] Early Friends Families of Upper Bucks, Clarence Vernon Roberts, (Philadelphia, Pennsylvania: Clarence Roberts, 1925, 716 pages), Chapter IX. Blackledge Family, page 69 (Reliability: 4). [S411] Hoge, Lucina's Family Tree, Lucina Hoge Iddings, (Cincinnati, Ohio: MacBrair & Sons, Aft. 1878), Bottom Half (Reliability: 4). [S121] Nichols, families of Thomas and Mary, Donald E. Nichols, (Buchanan, Michigan: 1999, 59 pages), page 4 (Reliability: 3). [S443] Compendium of American Genealogy, Frederick Adams Virkus, F. I. A. G., (Chicago, Illinois: A. N. Marquis, 1925-1942, 7 Vols. ), https://familysearch.org/search/catalog/172707?availability=Family%20History%20Library., Vol. V, page 586 (Reliability: 3). [S443] Compendium of American Genealogy, Frederick Adams Virkus, F. I. A. G., (Chicago, Illinois: A. N. Marquis, 1925-1942, 7 Vols. ), https://familysearch.org/search/catalog/172707?availability=Family%20History%20Library., Vol. VI, page 723 (Reliability: 3). [S147] Illinois, La Salle and Grundy Counties, (Chicago, Illinois: Lewis Publishing Company, 1900, 873 pages), page 513 (Reliability: 4). [S329] Hogg DNA Project, Dwight Hogg, (http://hdhdata.org/hoggdna.html), Descendants of Sir John Hoge of Musselburgh Scotland: NJ1682 | http://hdhdata.org/roots/h2721.html (Reliability: 2). [S9] Ancestral File, FamilySearch, (Salt Lake City, Utah: Intellectual Reserve, 1995-2005), X7K7-2H (Reliability: 3). [S493] Tenmile Country, Howard L. Leckey, (Baltimore, Maryland: Genealogical Publishing Company, 2001, 1977), ISBN: 0806350970, 9780806350974., page 100 (Reliability: 3). [S493] Tenmile Country, Howard L. Leckey, (Baltimore, Maryland: Genealogical Publishing Company, 2001, 1977), ISBN: 0806350970, 9780806350974., page 102 (Reliability: 3). [S64] Kenzie, Ross B. Kenzie (compiler), (RootsWeb.com: 30 Aug 05), Descendants of John Hogue | http://homepages.rootsweb.com/~kenzie/GenJOHN.htm (Reliability: 3). [S492] Brayton Collection, Tina Brayton (compiler), (Santa Cruz, California: 1992), Binder 254: Hodge-Hogg (Reliability: 3). [S131] Pedigree Resource File, FamilySearch, (Salt Lake City, Utah: Intellectual Reserve, Inc.), Submission: MMS9-7CH, (4 May 2011) (Reliability: 3). [S66] Hoge, Nichols and Related Families, William D. Nichols, (4578 Rain Park Drive, Fairview Park, Ohio 44162, Sept 1969) (Reliability: 3). [S342] Washburn, Mabel Thacher Rosemary Washburn, (Greenfield, Indiana: W. Mitchell Print Company, 1952, 214 pages), page 180 (Reliability: 3). [S442] Grandon Genealogy, James Grandon, (Springfield, Missouri), http://web.archive.org/web/20071009103805/www.grandons.org/., Ten Mile Country and its Pioneer Families, p. 100 (Reliability: 2). [S65] Pioneers of Old Frederick County, Cecil O'Dell, (Marceline, Missouri: Wallsworth Publishing Co., 1995), Library of Congress: 95-92197., page 285 (Reliability: 4). [S856] Quaker Meeting Records, Ancestry.com, Pennsylvania, Bucks, Richland Monthly Meeting, Births & Deaths, 1750-1805 (Reliability: 4). [S329] Hogg DNA Project, Dwight Hogg, (http://hdhdata.org/hoggdna.html), Descendants of Sir John Hoge of Musselburgh Scotland: NJ1682 | http://hdhdata.org/roots/h2721.html (Reliability: 4). [S65] Pioneers of Old Frederick County, Cecil O'Dell, (Marceline, Missouri: Wallsworth Publishing Co., 1995), Library of Congress: 95-92197., page 286 (Reliability: 4). [S411] Hoge, Lucina's Family Tree, Lucina Hoge Iddings, (Cincinnati, Ohio: MacBrair & Sons, Aft. 1878), Top Half (Reliability: 4). [S9] Ancestral File, FamilySearch, (Salt Lake City, Utah: Intellectual Reserve, 1995-2005), X7H7-VF (Reliability: 3). [S410] Hopewell Friends History, Hopewell Friends Staff, John Walter Wayland, (Heritage Books, 1998), ISBN 0788408585, 9780788408588., page 537 (Reliability: 3).